This was Bang & Olufsen’s first domestic telephone. It appeared quietly on the last page of the 1990 catalogue, but was an introduction for a whole range of successful products to come. Though its entrance was unspectacular, the same could not be said of the design. By this point a very strong Bang & Olufsen visual identity had been established, so it would have been very easy to design any domestic electronic product along these lines. This being the case, where were the sharply machined naked aluminium parts, red LED readouts, smoked glass, touch panels, tight cloth frets and all then other “B&O” elements that made the rest of the range so distinctive? The strange thing is that despite the absence of all these things, the Beocom 2000 was still unmistakably, and could only be, a Bang & Olufsen product. Text copyright © Beocentral. Unauthorised reproduction prohibited. Something else that marked out the Beocom 2000 as a true B&O design (and it was, the internal parts were made by B&O and not shared with other telephones) was the sound quality. One would have thought that the limited bandwidth of a standard telephone would have made the design of quality instruments to connect to it pointless, but the design of both the loudspeaker and the microphone in the handset were acoustically correct, giving amazingly natural reproduction and removing the fatigue from long calls. The light weight and considered ergonomics help here too. There was also a loudspeaker and volume control in the base unit that could be switched in and out by a key on the keypad. Text copyright © Beocentral. Unauthorised reproduction prohibited. 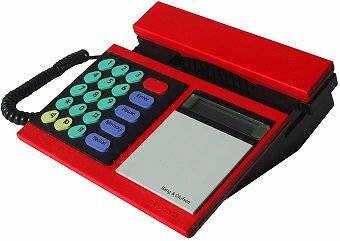 The base unit used microprocessor technology to make daily use easier, 20 numbers could be stored, one being an “emergency” number that was accessed directly by a large red key. In addition, the last three dialled numbers were automatically stored. In case the instrument was disconnected or moved, a lithium battery maintained the memories. These features all operated in conjunction with an LCD display panel, and it is interesting to note that this was the first time this now common device was used in a B&O product that was not a remote control unit. Despite the sophisticated electronic memory, there was also a “back up” in the form of a concealed writing pad under a sliding cover on the right hand side. Also under there were two miniature controls, one to select one of 8 ringing tones, the other to switch between tone and pulse dialling. Text copyright © Beocentral. Unauthorised reproduction prohibited. The Beocom 2000 had a long life in the range, though it lost its most distinctive feature, the coloured keys, in 1993. Text copyright © Beocentral. Unauthorised reproduction prohibited.